Coconuts are an exotic food. Coconuts are actually very healthy-they are not only high in protein, but also in electrolytes and healthy fats. It's no wonder that they're an important food source for the people who live where they grow. Despite their misleading moniker, coconuts are not even nuts, but rather large seeds. Since coconut palms - the trees that produce coconuts - are tropical plants, coconuts can usually be found in coastal beach areas near the equator. To be specific, the tropical region extends 25 degrees north and south of the equator, so places within this zone will most likely have coconuts. This includes Thailand, the Philippines, Hawaii, Brazil, New Guinea, and many others. Is a Coconut a Nut or a Fruit? The coconut palm, also known as Cocos nucifera, takes seven years after it has been planted, to produce any fruit. The seeds grow from the center of the tree, close to where the leaves protrude from the trunk. 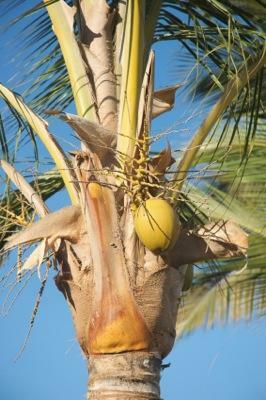 The trees produce seeds all year long, so at any given time a tree can house coconuts at any stage of development. This varied rate of development can actually be a problem, since palms are known to drop their wares randomly from about 30 feet in the air! If you're walking in an area where there are coconut trees, you must be careful not to get smashed in the head by falling seeds, which are also known to take out the windshields of unlucky cars. Where Can You Get One? Thankfully, many grocery stores are beginning to carry fresh coconuts in their produce section, so you don't need to take a trip to a deserted tropical island to experience the joy of fresh coconut. Ask your local grocery to carry young Thai coconuts, which are known for their particularly tender flesh.